Family caregiving is a unique role that offers the chance to make sure your senior loved one receives the best of care. Even if you love what you do, there are also times when you may question your decision to take on this responsibility. When those moments occur, remind yourself of these seven advantages of choosing to be a family caregiver. Your kids and other younger members of your family are constantly learning from what you do. When they see you help your loved one walk up a step or make sure he or she is clean, they learn the importance of showing respect for the elderly. You can even involve your kids in your loved one’s care so they get a real-life taste of how good it feels to help someone else. Once you hit adulthood, it becomes more difficult to stay active, and this is especially true if you work at an office job that requires long periods of sitting. As a caregiver, you spend a lot of time on your feet helping with your loved one’s needs. Although it can be tiring at times, moving more can keep your body strong. You might not have ever known you have a penchant for gardening or woodworking if you didn’t spend so much time with your loved one. Many older adults still have things to teach their caregivers, and you may have found out that your loved one’s passion for knitting is contagious. Planning activities for your loved one opens up doors to new things you may also enjoy. Managing stress is often viewed as a necessary drawback of caregiving. However, you can also look at this as a major benefit of your role. Many people never realize the importance of taking a break and learning how to keep stress from ruining their day. Now that you’re a caregiver, you know self-care is a priority. The lessons you learn about taking time out for respite can also help you manage other types of stress that occur in your life. Keep in mind you don’t have to take on all the caregiving responsibilities yourself. Many seniors prefer aging in place over moving to an assisted living facility. 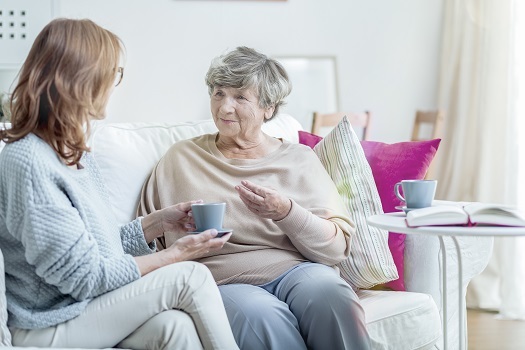 If your senior loved one needs assistance to remain safe and comfortable while living at home, reach out to Home Care Assistance, a leading Huntington elder care agency. Our dedicated in-home caregivers can assist with meal prep, bathing and grooming, exercise, medication reminders, and many other important tasks. One of the scariest things about having your loved one get older is knowing that he or she may not always be able to protect him or herself from harm. Fortunately, your mere presence reduces your loved one’s risk of being hurt by falling or accidentally starting a fire. You can also arrange for another home caregiver to stay with your loved one during times when you need to leave temporarily. Managing your loved one’s health teaches you valuable things about your own health. For instance, you’re more likely to eat a sensible lunch if you must plan a healthy menu for your loved one. Depending on your loved one’s needs, you can also learn about how to prevent diabetes or control high blood pressure. All of these things can help you stay healthy, too. Family caregivers need to care for their own wellbeing. If you’re caring for an aging loved one and are feeling overwhelmed, consider hiring a professional caregiver to provide respite care. Huntington families who want to prevent burnout can turn to Home Care Assistance. One of our professional caregivers can assist your loved one at home while you take a nap, go to work, run errands, or go on vacation. Many people never get enough time with their aging loved ones to truly know them. Now, you get to see your loved one in a whole new light. Sharing activities together and managing your loved one’s daily needs are great ways for you to strengthen your relationship. Being a caregiver for a loved one can be extremely rewarding, but it can also become overwhelming at times. Seniors can face a variety of age-related challenges. Though some families choose to take on the caregiving duties, there may come a time when they need a trusted Huntington home care service provider. Families sometimes need respite from their duties so they can focus on their other responsibilities, and some seniors need around-the-clock assistance that their families are not able to provide. Home Care Assistance can be your trusted partner when your loved one needs help with the challenges of aging. Call us today at (304) 521-2909 to learn about our high-quality in-home care services.